SharpShooter Reports.Win is the powerful .NET report component that will easily add reporting features to the Windows Forms apps. Create elegant and visually appealing reports in the intuitive report designer and deliver reports to your end users in the desktop report viewer or provide them in a document format (PDF, Excel, RTF, HTML, XPS, etc.) for further exploration and analysis. SharpShooter Reports features a rich set of tools to create even the most sophisticated reports with less time and effort. 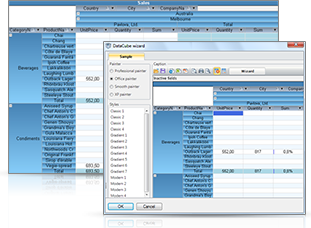 You can design simple, multicolumn, side-by-side, hierarchical, pivot table, sub-report reports and many others. Easy data visualization with built-in charts, gauges and images provides high performance analytical abilities.End user designer is provided. SharpShooter OLAP helps developers build powerful pivot tables to let users explore and analyze data infinitely. Data in pivot tables can be easily grouped, filtered, sliced, drilled down and rolled up, aggregated, ranked and pivoted. Interactive charting of pivot table data (with any third party charting tool) makes the component perfect solution for corporate information analysis. SharpShooter Charts and SharpShooter Gauges offer complete tools to design ultimate charts and gauges. You can create rich data visualizations from scratch or get pre-built gauges or charts. The following chart types are provided: Bar, Line, Spline, Area, Pie, Bubble, Candle Stick, Stock and others, all together 180+ charts. Gauge library includes Meters, Dials, Sliders, Switches, Digital numbers and text, and other circular and linear controls, all together over 180 gauges. 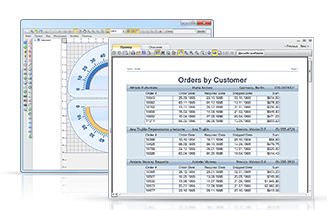 End user designers of charts and gauges are available. All software components are completely compatible with each other, so you can focus on the application essentials instead of trying to adjust components to each other. As a Gold Certified Partner in the Microsoft Partner program, Perpetuum Software has been providing a wide range of Microsoft Visual Studio components for over 8 years. Perpetuum Software product lines include WinForms, ASP.NET, Silverlight, and Mobile components, and tools for SQL Server Reporting Services. Among them are .NET reporting tool, OLAP component, and such data visualization libraries as gauge and charting products. All the products can be ordered via Share-It and PayPro services.